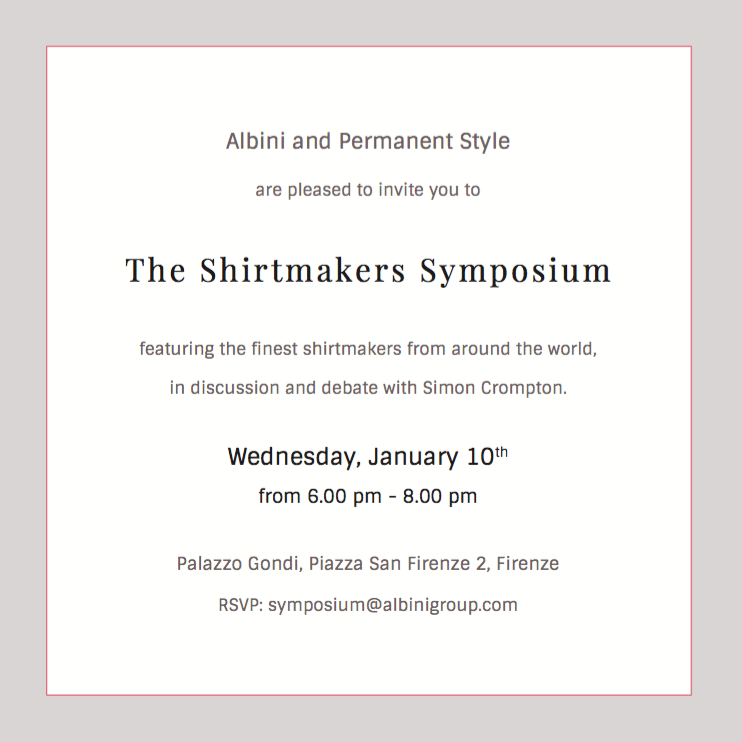 I'm pleased to say we have all the details confirmed for our Shirtmakers Symposium in Florence this January. Please do RSVP to symposium@albinigroup.com if you would like to attend. We expect it to be quite packed. The location is Palazzo Gondi, in the centre of Florence. So no walking south of the Arno this time. I was keen with this Symposium to get a range of makers from different locations - hence bringing in both Hong Kong and the US. But I also wanted to keep it to five speakers, as six has felt a little too many in previous years for everyone to get really involved. Each of the five will be making a shirt to display at the event - with the theme 'Smart/Casual'. The idea is that they will be the makers' interpretation of a shirt that can work in a modern, casual office, and also transition to the weekend or another informal occasion. Alongside this, sponsors Albini will be presenting their latest development in a separate area. It should be really interesting. I'm looking forward to digging into all the details of shirtmaking - and discussing people's views of the future. You can follow the discussion on Shirtmakers and details announced for the Symposium by entering your email address in the box below. You will then receive an email every time a new comment is added. These will also contain a link to a page where you can stop the alerts, and remove all of your related data from the site. I visited the PS shop at the weekend. It was not bad but lacking on the artisans this time which I for one really enjoyed in the past. Would have been good to see the Parisian glove makers again as they are excellent and also Stefano Bemer and LA Shirts of Napoli. That’s good to know – the big problem with pop-up shops is getting good spaces with enough notice, and although we really like this space, it’s not big enough to have visiting artisans really. Hopefully next time. Video will likely not be possible, but we’re looking at audio options. Love the smart/casual theme – very relevant in today’s more casual office environments. Shame I have absolutely no excuse to be in Florence at that time, but looking forward to the write-up! Even though I’m based in casual Southern California, I make pinstripe suits in almost the amount as solids. It’s windowpane suits that are the bigger challenge to convince my clients to add to their closets. We only wanted one from each discipline or area – as has been the case with all the Symposia we have done. But Neapolitans dominate on high end shirts market . Maybe at least two Neapolitas would be grate. They may dominate, but they would have the same things to say?